Jambo Rafiki (hello friends)! This is Jane, we are at Kosovo camp site. We just finished our dinner. 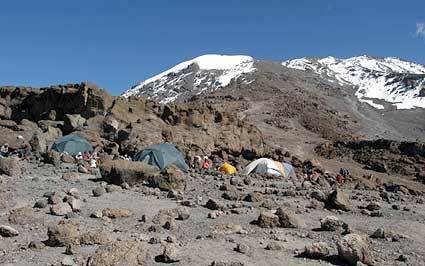 What a wonderful day we’ve had climbing up through the Barafu base camp. We had lunch there and we are spending the night a little higher at Kosovo camp. On our way today, we got half way up the trail and Bakwa, who is the harmonica player, came up behind us and started playing the ‘hail mary’ on his harmonica. Isn’t that just fabulous! Once we arrived at Kosovo we gathered in a circle of friends and we had a wonderful prayer from our guide Julius. This prayer was for our summit journey. We are looking forward to being woken up at midnight to head for the summit. Jambo kakas and dadas (hello brothers and sisters)! We left Karanga Camp this morning. We are on day 5 of the Machame trail, it is absolutely fabulous. As I have said before, I am just having the time of my life. Started off the morning with singing and dancing again, the heart rates flying in the thin air. It was just amazing, and then we headed up the trail into thinner air. More hiking up scree and slate terrain. Jambo, Bob Ski at Kosovo, 4,800 meters. We are looking up at Kibo which is hiding in the clouds, Julius says it’s shy. 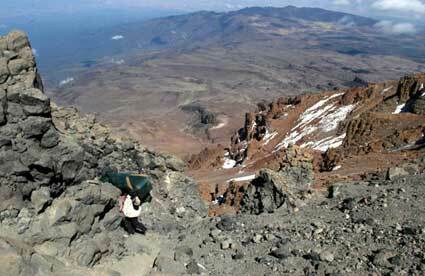 We are very excited to start our climb to the summit and to be there by sunrise. We will be thinking about you all back home, God bless.